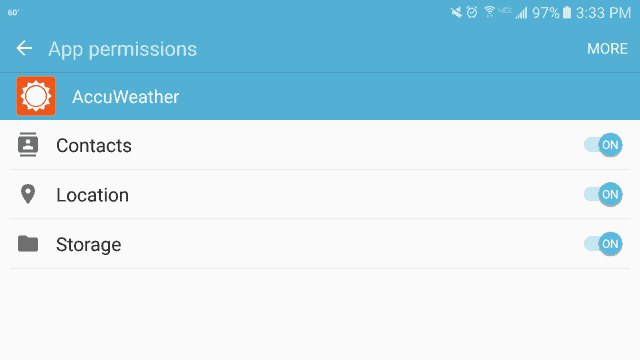 Marshmallow has changed the way Android users can set, change, and learn more about permissions on their devices. While Marshmallow is available on the Samsung Galaxy S7, it’s slowly rolling out to Nexus and Android-based devices. If you wanted more control over how apps work with your phone, your prayers have been answered in some ways. 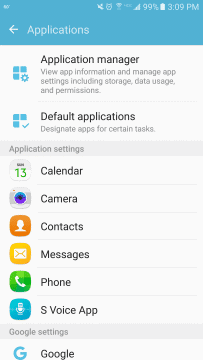 Let’s look at how the Marshmallow permissions work on the Galaxy S7 and why you should know about this important change. The first change to permissions in Marshmallow you’ll see frequently on the S7 is pop-ups asking for your permission to do everything as you go. Using Google Hangouts? You’ll need to give it permission to record audio. Saving some pictures from Facebook? You’ll have to allow it access to storage. This list could go on and on. In most cases, you’ll allow everything that pops up, because you’ll assume it’s necessary to use the app. In all honesty, it generally will be. If you’re not sure if what you allowed is actually necessary, you can change permissions on the S7 with Marshmallow unlike any other version of Android out there. Here’s how. Note: If you’re using an older app that’s not using the latest version of Android as a guideline for how it deals with permissions, you may only be able to blanket allow or deny all permissions. If you don’t allow everything, you may end up disabling the app so be cautious as app developers catch up. Swipe down and click the “Gear” icon. Scroll down to Applications and click on it. Click on any application. For this example, I’ll use AccuWeather. 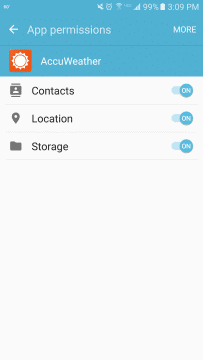 Under the Permissions settings, you’ll see that AccuWeather is allowed access to contacts, location, and storage. Click on that setting. You’ll now be given the option to change permissions and toggle them on or off. My first question for AccuWeather is this: Why do they need permission to my contacts to tell me the weather? 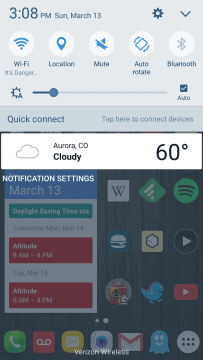 If you click the slider off, that app will no longer have access to that area of your phone. 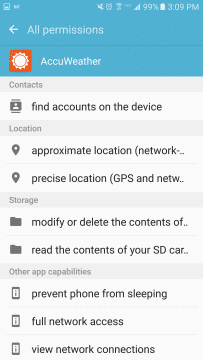 If you click on any of the areas of permission a specific app, you’ll be given a complete breakdown of everything the app can do under each area and more. 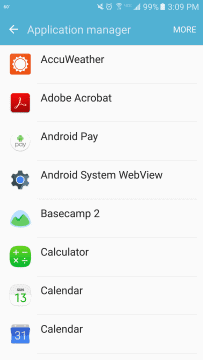 You can do this for every app that has access to areas of your Samsung Galaxy S7 or any phone using Android Marshmallow. Android users have been waiting for Google to give them more control over how apps interact with other functions of their phone. With permissions often ambiguous over what they can and can’t do on your phone, you never truly know what an app is up to. Now that you have more control over what they can do, what will you do with that newfound option? 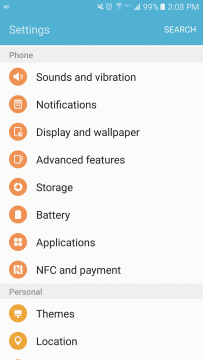 While the Samsung Galaxy S7 is the first phone to come loaded with Marshmallow, it’s only time before other Android phones follow suit and give you the same permission options.